Glad that long flight is over. 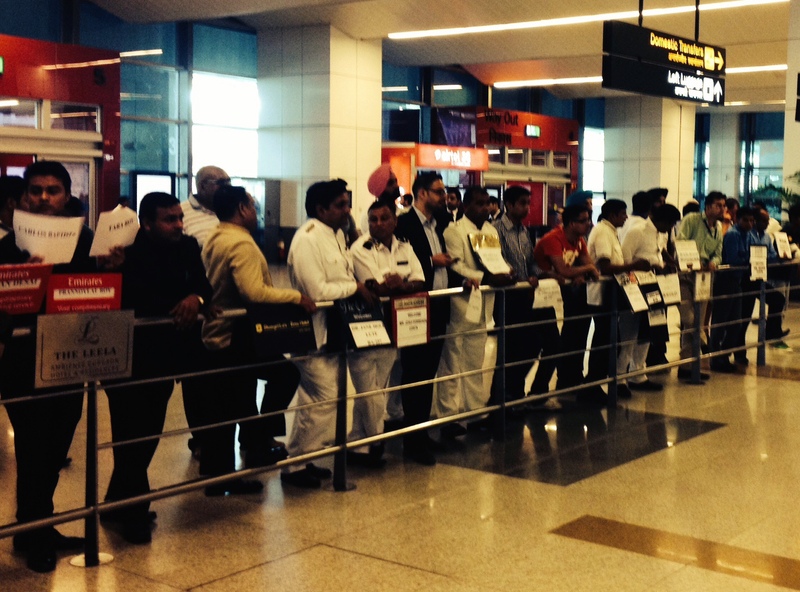 Memsahib and I sailed through customs at Delhi's 'Indira Gandhi International Airport'…. no worry's about th excess wine we have either. The main concern for the authorities seemed to be the Ebola health inspection check that everyone off the Emirates flight had to go through…. all flights coming from the Gulf States are being checked. After seeing how overcrowded this city is when we toured Delhi yesterday, I hate to imagine how bad it would be if there was an outbreak of the disease here. 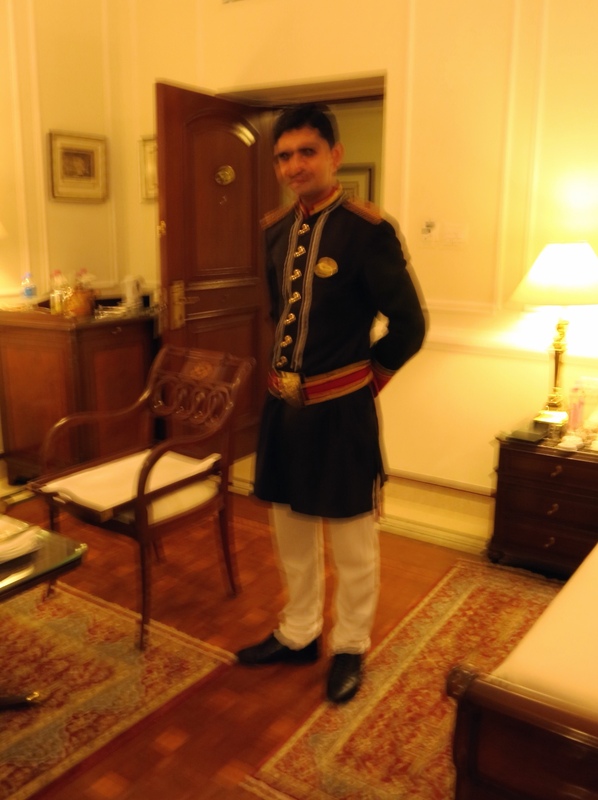 Hello Sir, velcomingin you to Delhi..
A short ride later we arrive at our hotel for the next two nights, the very 'Imperial' Imperial Hotel, New Delhi…. very pukka indeed. 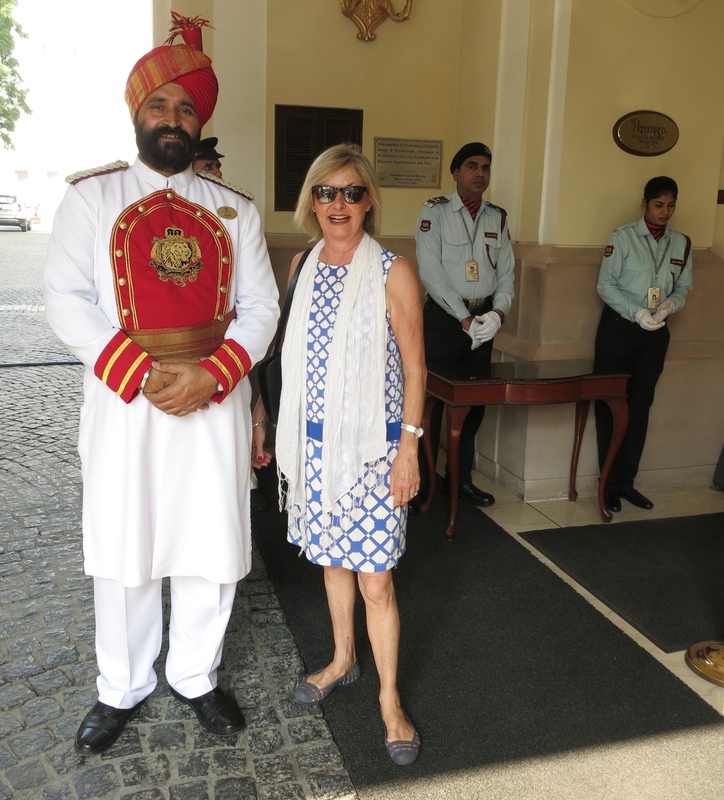 Memsahib, welcome to the Imperial. would you like iron with your G&t sir? 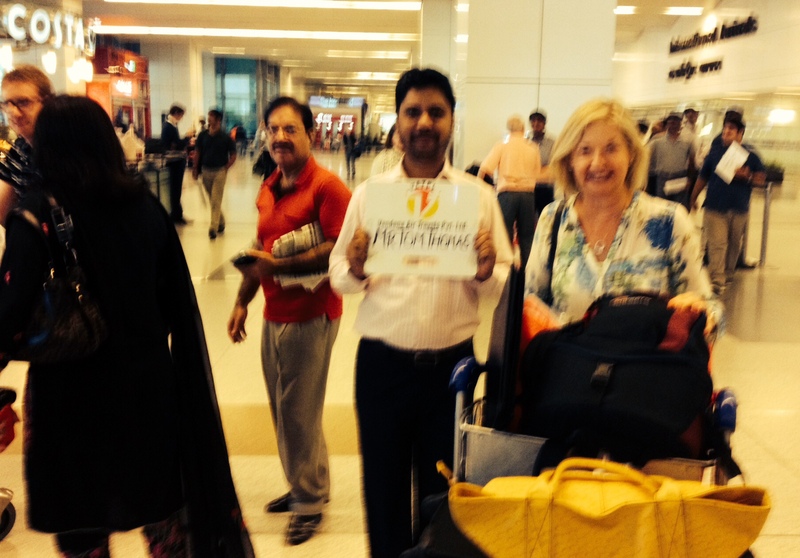 After a quick shower and change, we hit the road with our driver Dev Singh as our guide. 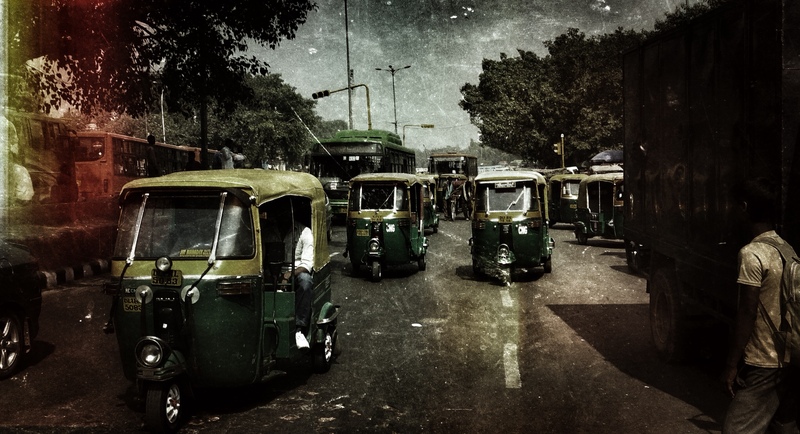 First stop is at an ATM in Connaught Place to get some Ruppees….not as straight-forward as it seems. The first ATM doesnt like my card….I'll rephrase that….it liked my card enough that it wouldnt give it back! As always in India, you are never alone, and I am 'helped' ( a relative concept here) by half a dozen locals to get it back…. mainly by bashing the ATM, then kicking it…. ( and possibly swearing very loudly in Hindi, but cant swear to that!). Faster than you can say 'Open Sezame' ( the extent of my Hindi) my card slowly inched it's way out of the slot, and I grabbed it with joy….. I may have even kissed it. ( I am really nervous and wary of all ATM's since one of them 'swallowed' my card in Vancouver). Card in hand, but still no Rupees, Dev takes me to another one, a real grimy 'hole in the wall' place, but has three security guards outside…. they also came in to watch me just in case. This time I had more success as the cash machine didnt need to swallow the card… you insert card, ( still holding it) and when it's read it, you remove…. great idea. Memsahib's expensive Christian Dior watch has stopped a couple of hours ago, and possibly it's just the battery needs replacing, so we find a watch repairer, who changes the battery in front of us….for only 500 rupees ( $10). Next stop on our tour is India Gate, the national war memorial. As it's a Saturday, it is quite crowded ( to our eyes), but Dev tells us that tomorrow, Sunday, there'll be twice as many people here. Our final stop on Dev's tour is to the famous ( well, not that famous, I'd never heard of it!) Sikh Temple, the Gurudwara Bangla Sahib. As I am not appropriately dressed, ( no head covering) Dev picks me out a bandanna type orange coloured cloth from a big communal bin at the entrance. I notice it's quite grubby and offer a silent prayer to Waheguru ( he's the Sikh God for thiose who dont know!) that the last devotee who wore it didnt have any head lice. As you can see by the photo below, there is a big pond in the middle of the complex, teeming with fish…big fish. It could be an angler's paradise, but as Sikh's are vegetarian, they don't allow any fishing here. What a waste! 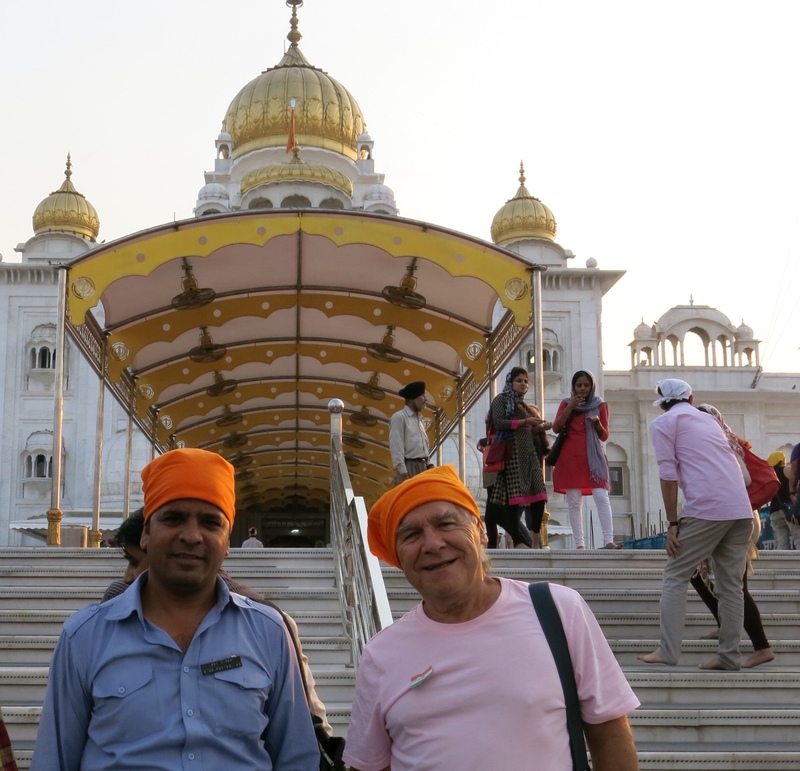 After a quick look around the temple we head back home…. well, the Imperial anyway. We ask Dev to drop us off at the market place on the way so we can check it out… maybe buy somethinhg…..we tell him we'll find our own way back. Dev wont have a bar of it, telling us it's his responsibility and company orders to only drop us back into the safety of the hotel. 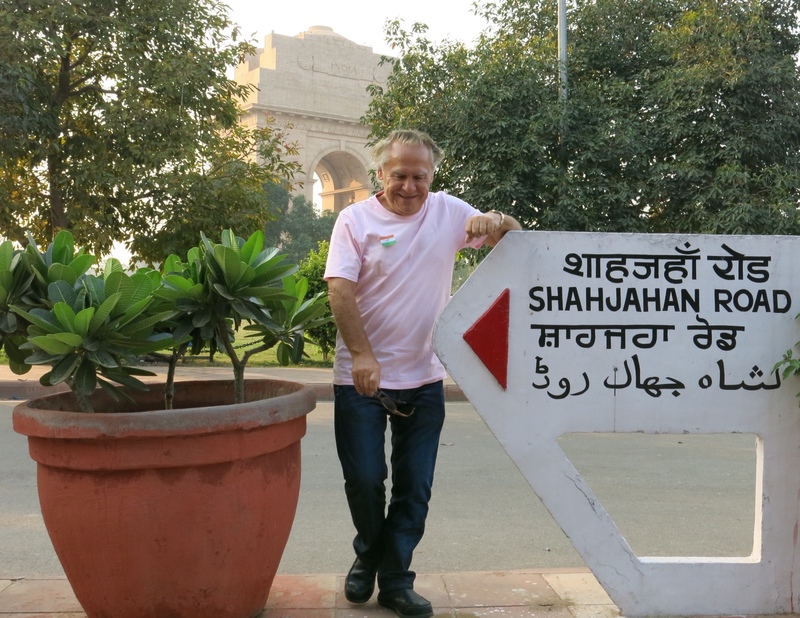 He tells us that under no circumstance are we to go wandering around Delhi on our own……and gives a brief outline of all the bad things that we may encounter. 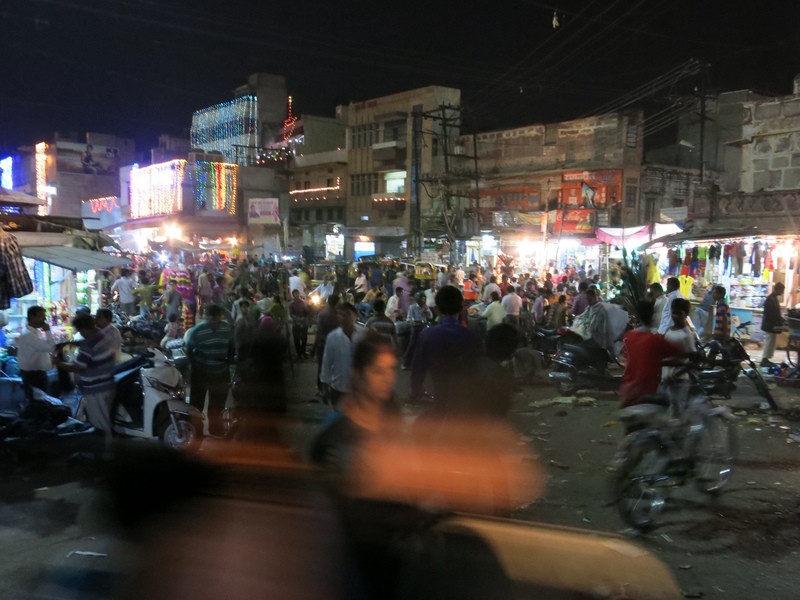 Dont go off the main street…don't be lured into back alleys or side streets….don't follow anyone who offers to take you to their shop…dont catch a Tuk-Tuk ( motorised rickshaw) …Just ask me, I will take you anywhere, he tells us. OK Dev, we give in, take us back to the Imperial. After a shower and and a drink, M and I, ignoring every rule that Dev has told us, leave the hotel ….. it's dark by now….and walk along the road on the way to Connaught Place, the centre of the 'New' Delhi…. we pass a market that looks interesting, and make a turn into the narrow streets of the bazzaar. We hadn't gone but 50 metres when we heard a HUGE explosion. 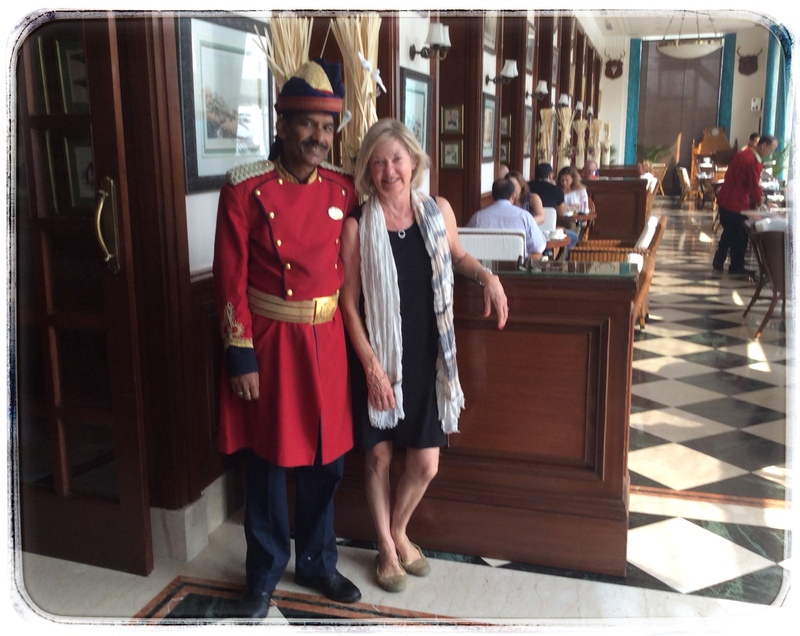 Memsahib grabbed my arm , almost pulling me to the ground on top of her ” What the hell was that' I heard her say…. a second series of 'shots' followed, and I really thought we'd been caught up in a terror attack. Our immediate thought was that it was a bomb, but looking around at the unconcerned mob around us, maybe not. Picking Memshaib up, dusting her down, ( dusting, not really….it was more than 'dust' on her dress, did I mention the cows everywhere, they are sacred here, and wander about shitting wherever they want) and regaining our composure I realise that it must be someone starting Deepwali ( or Deewali) little early…it's the biggest Indian festival on the calendar….a mix of Christmas and New Years Eve rolled into one…. where the big thing is to let off as many 'bangers', firecrackers and fireworks as possible. ( and scare the hell out of tourists ) It's a moveable festival, held on whatever is the darkest night between October and November each year ….. It kicks off on 22nd October this year, and we'll be in Jodphur for it…. We walk all the way around the perimeter for about an hour, and decide that the best thing to do now is to take a tuk-tuk back to the Imperial (wow, thats gonna be a trifecta of DV's commandments broken! ) 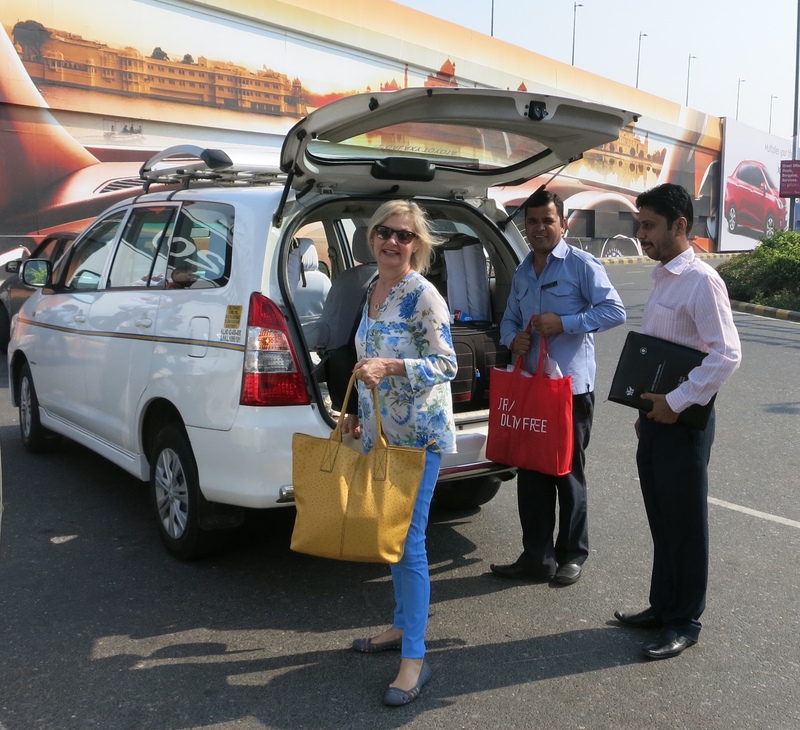 After some good spirited haggling over price….. ” 500 rupees sir, very cheap” ….. ” you gotta be kidding”…. ” OK sir, I not kid you….only 200 rupee”. We settle on a 100 rupee ( $2) and hop on. At the Royal Show they would charge you at least $20 for a thrill ride like we are experiencing….. this tuktuk driver is more skillful than Michael Schumacher ( not a good analogy, come to think of it!) and weaves in and out of traffic, seemingly ignoring every road rule that ever existed, ( do they even exist here I wonder?) …..he even takes a short cut up one of the main streets on the wrong side of the road…. head-on into the oncoming traffic!!!! Arriving back safely in the peace & quiet of the Imperial, it's been a ride that was both exhilarating and dangerous at the same time, but of course we were protected by the small statue of Ganesh, the Hindu God of luck, that sits on the tuk-tuks dashboard. I've come to the conclusion that there is only one road rule in Delhi….avoid at all costs hitting any other vehicle….or cow…. pedestrians have to follow another rule, just dont get hit. Actually, there are a couple of rules that the drivers here seem to follow….Traffic entering a road from the left has priority…..and so has traffic from the right….. and also traffic in the middle…… as for lane discipline ( there are rarely any lane markings) all traffic at all times and irrespective of the direction of travel shall ignore any lane. I've forgotten to mention how noisy it is too, with every vehicle on the road constantly 'honking' their horn…. even if there is nothing to honk at (though rarely is there 'nothing' to honk at) it's an unwritten rule that you MUST 'honk' at least twice a minute! This rule is never broken!